Five-term incumbent Sen. John McCain has good reason to fear a primary challenge. 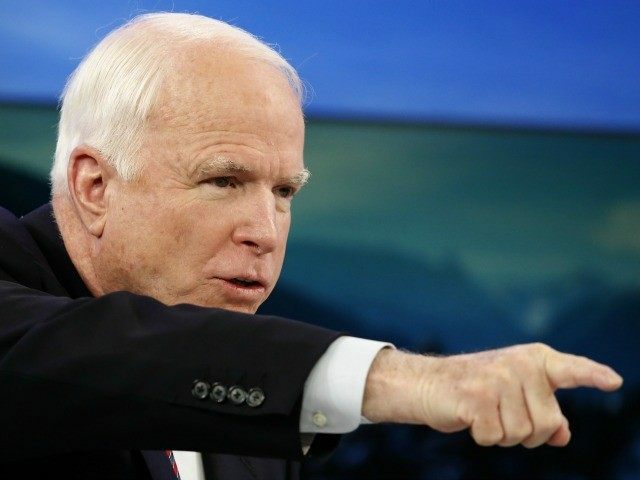 Newly released data from liberal-leaning Public Policy Polling shows half of Arizona’s Republican primary voters disapprove of McCain’s job performance, and more than half would prefer a more conservative Senate candidate in 2016. After more than three decades in Washington, McCain earns merely 41 percent approval from Arizona Republicans and 36 percent from general Arizona voters, PPP finds. Just 37 percent reported a willingness to support the Senator in his 2016 re-election bid. In the days leading up to his re-election declaration, McCain and wife Cindy each released letters asking for financial support. Notably, 51 percent of those surveyed in the poll indicated a desire for someone more conservative than John McCain as the 2016 Republican candidate for U.S. Senate in Arizona. Since that censure, McCain has accordingly voiced expectation that he will face a primary challenger in 2016. Large percentages of survey respondents took no position, favorable or unfavorable, on potential McCain challengers Representative Matt Salmon or David Schweikert, State Senator Kelli Ward or former gubernatorial candidate Christine Jones. With the 2016 primary elections still a year away, McCain’s extensive tenure gives him a big advantage in name ID. Still, every potential McCain challenger measured against the incumbent fell short of overcoming him, though all came within striking distance. State Senator Ward has come the closest to declaring. She opened an exploratory committee in April and has been weighing whether the financial and logistical path to victory is there. She has characterized a McCain challenge as a classic David versus Goliath battle. Each potential challenger is said to have time yet to make an official decision and it appears they are taking that time to weigh whether each can gather the necessary support to take on the political goliath.